Colorful plastic letters hit the floor with a soft clatter. “Again! Again!” It was our second time to act out our latest favorite book with a simple alphabet activity for Chicka Chicka Boom Boom, and the kids were begging to read it again. The kids loved the book Chicka Chicka Boom Boom from the moment I first read the book to them. I decided then that it was a great book to inspire some fun alphabet activities. For our first activity we started off by cleaning all the artwork from the front of the refrigerator. After all, we were going to need a big space to reenact the story. Then we put together our own paper coconut tree, taping each piece to the fridge. As I read each page of the story, they had fun hunting through our magnetic letters to find the right ones and having them “climb up” the coconut tree. Then came their favorite part — all the letters came tumbling off the tree (with a little preschooler help). They continued having fun with the magnetic letters long after we finished reading the story. 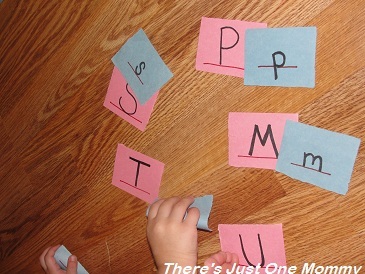 Then I pulled out our second alphabet activity: lower case and upper case letter cards. They practice matching up the lower and upper case letters together. It was a great way to get them to recognize some of the lower letters they aren’t as familiar with. It wasn’t long before they returned to the plastic letters and the coconut tree on the refrigerator. 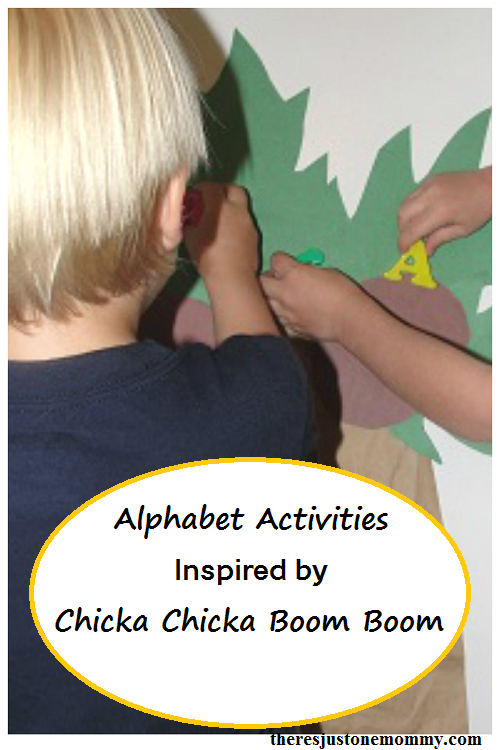 We had lots of fun with our alphabet activities for Chicka Chicka Boom Boom and look forward to more book activities in the future. My children love this book too! It’s practically falling apart. I love your tree. It sounds like it was a big hit. LOL – looking at our tree you can tell I had some preschool help. 🙂 It’s actually still on the fridge and being played with. This has long been a favourite of my sproutlets. LOVE your activity! Thanks! They’ve played with the letters and tree all week. Wow I love this! My daughter absolutely adores that book, we read it all the time. She’s only 2 but she could definitely do this activity! FUN! What a fun idea. It looks like they had a great time. Thanks for sharing. They had so much fun we still have it on the fridge! How fun! Love this book. I’ll have to reenact it with my preschooler as well. Thanks for the idea! 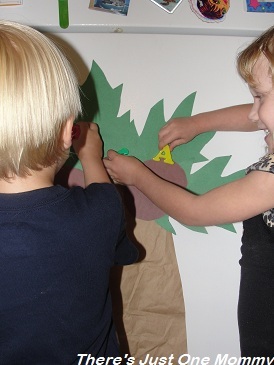 My kids love that book too….cute activity witht he tree! It does seem to keep kids entertained! Such a great activity. Way to teach your little ones in a fun, creative way! I’m going to have to check out that book! Magnets are always a hit! (The biggest problem was a few getting kicked under the fridge, but then they got to fish them out with a long stick…. ) Definitely rec. checking out the book! Love the idea of the large tree on the fridge! This book is the one we are going to be doing activities with this coming week so it’s great to hear that your kids enjoyed it. I’ll have to check that book out! Do you have any suggestions for good books for 11 month olds? My baby loves books, but has a very short attention span. I’m impressed by your creativity! My son’s favorite author when he was that age was Sandra Boynton. He loved all her books! Definitely would suggest checking them out! What a fun idea. How educational. So many book possibilities too. We love playing with our books! 🙂 My son can’t wait for us to do Wacky Wednesday by Dr. Seuss…. It remains one of their favorites around here — we even had to get the Leap Frog Tag version so they could read it to themselves. 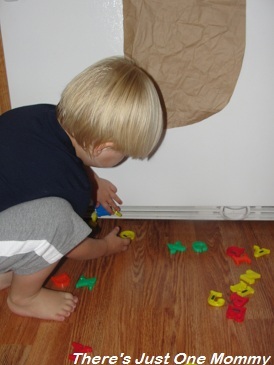 What a fun and easy way of incorporating learning about letters into a busy day’s activity! Well done.